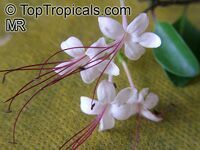 This shrub ranges from tropical Asia to western Polynesia (Niue) and is found on most of the high sand islands of this region. 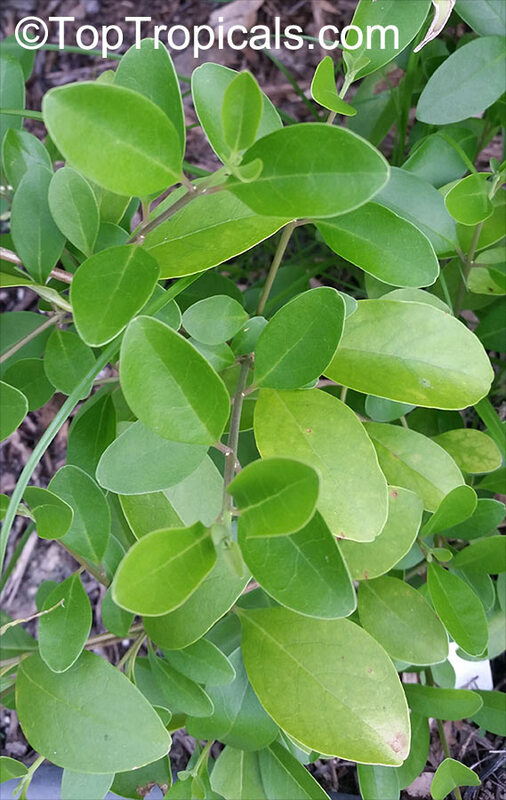 C. inerme is an evergreen mangrove plant, which has found a place in our gardens, is able to thrive near the ocean at the high tide mark, making it a potential weed in the coastal environment. 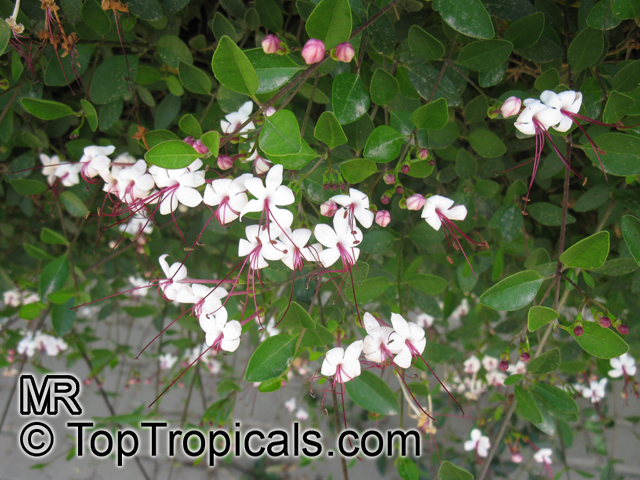 A hardy, straggling shrub, it reaches a height of 9-12 FT with closely arranged, almost round, shiny, deep green leaves. The plant is always in flower. 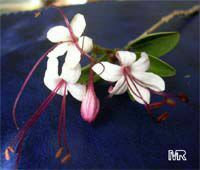 The flowers are white and very fragrant, with spreading five corolla lobes, 1" long white tubes and long purple stamens. 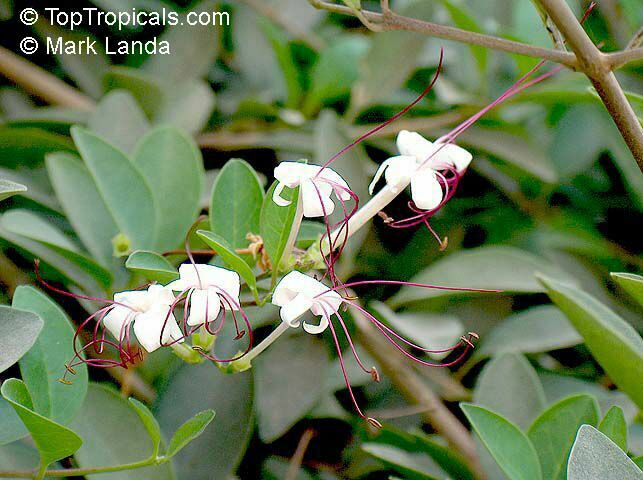 As the specific name implies, the stems are smooth and are devoid of thorns. The plant is not choosy about the soil and can even withstand droughts. Seaside clerodendrum, as its name suggests, grows well along the beach tolerating the salt spray of the ocean and the harsh rays of the sun. 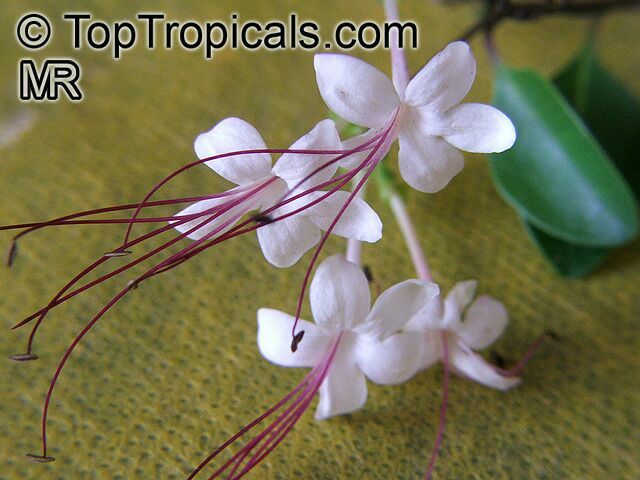 It is a versatile plant and can be grown as a topiary or as a bonsai. 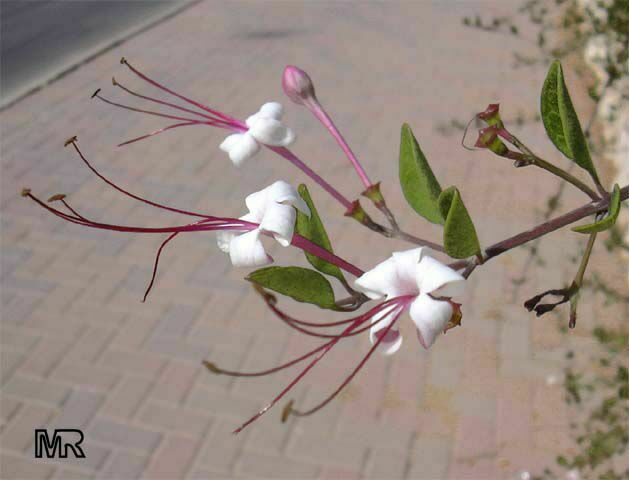 It is its hardy nature and the closely held bunches and leaves that promoted it into a garden plant. 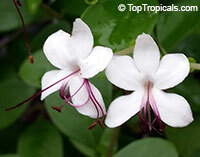 Clerodendrum inerme is a sun loving plant and a sunny spot should be chosen for it. The plant produces suckers and seeds. For making hedges, a large number of well-developed plants are required and, therefore, it is advisable to produce new plants through cuttings. 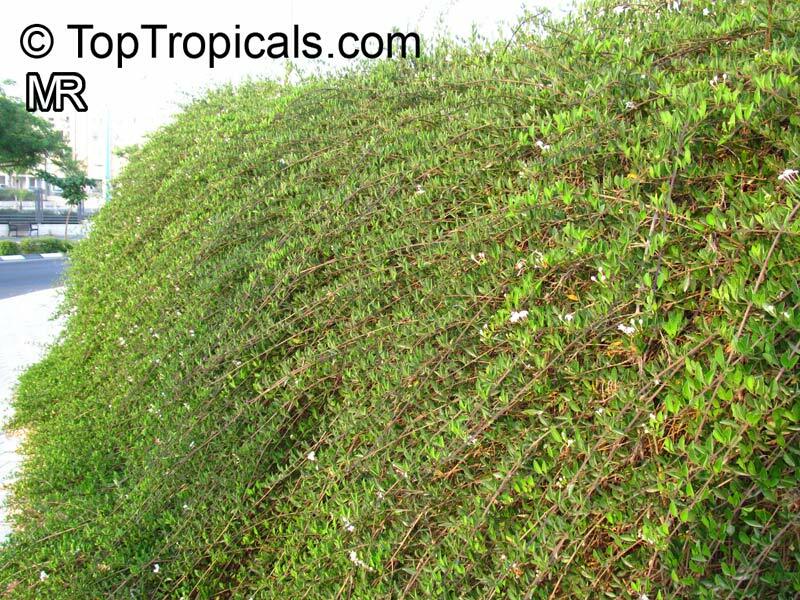 Trimming the plant keeps the hedges in shape and also promotes production of new branches and leaves to fill up the gaps. As flowers are produced at the ends of branches, trimming robs the plant of its flowers. 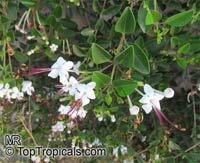 The plants is salt-, heat- and wind-tolerant. 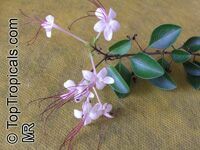 Natal glorybower, Cats whisker. Shrub or small tree, fissured bark, showy heads of white flowers with pink stamens. Clerodendrum inerme, Volkameria inermis. 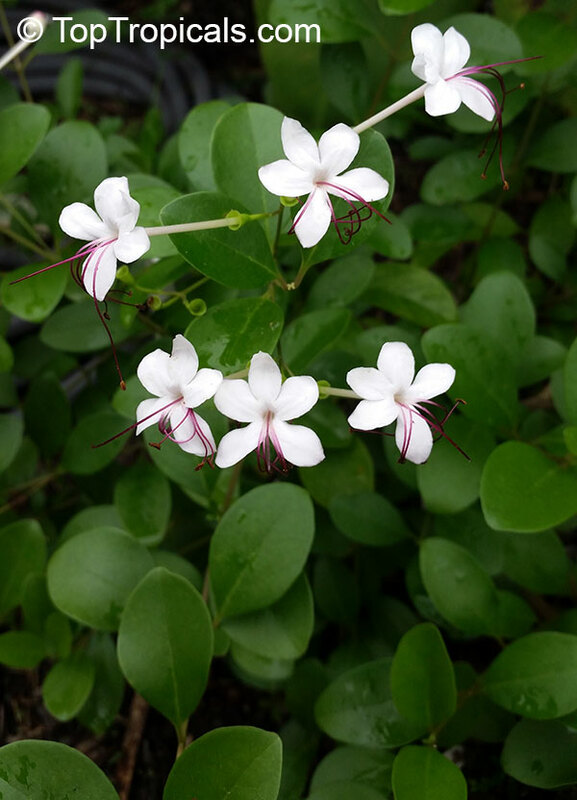 Wild Jasmine, Sorcerers Bush. A hardy, straggling shrub, with closely arranged, almost round, shiny, deep green leaves. The plant is always in flower. 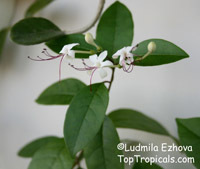 The flowers are white and very fragrant, with spreading five corolla lobes, 1" long white tubes and long purple stamens. 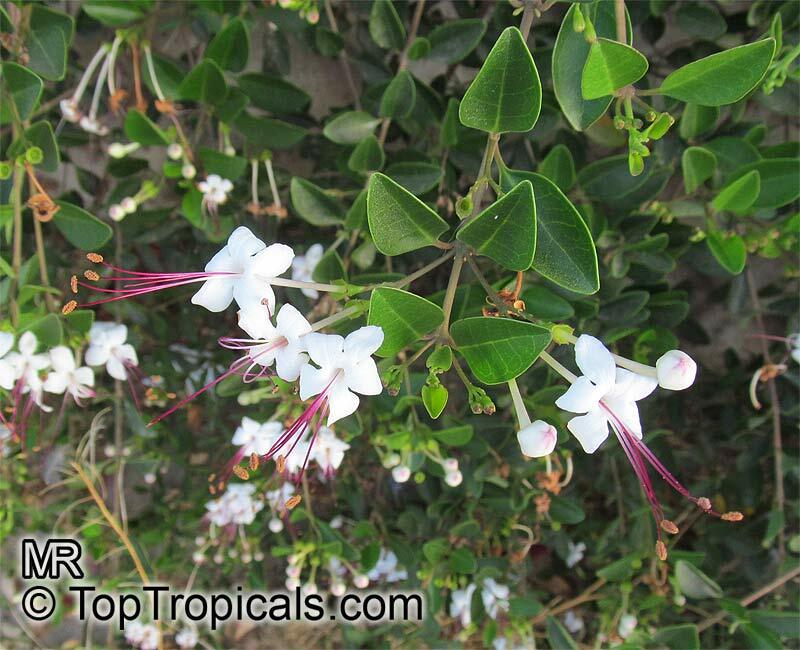 As the specific name implies, the stems are smooth and are devoid of thorns. The plant is not choosy about the soil and can even withstand droughts. 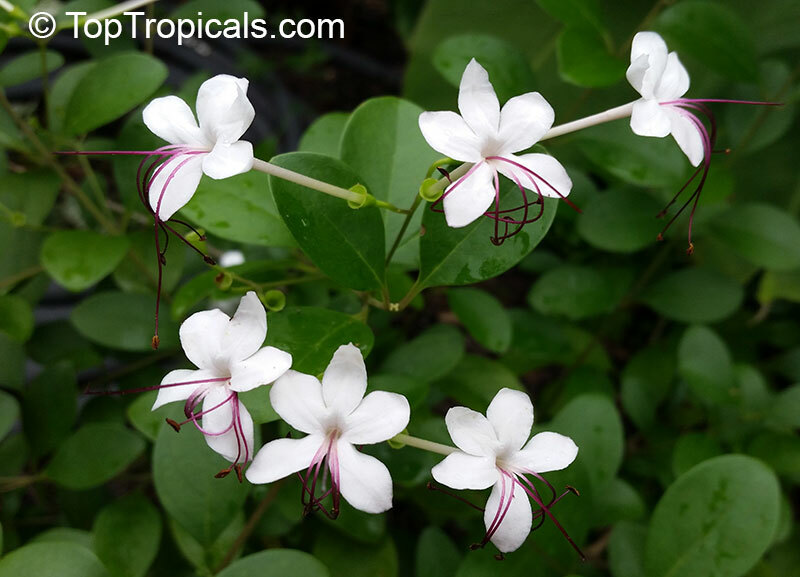 Seaside clerodendrum, as its name suggests, grows well along the beach tolerating the salt spray of the ocean and the harsh rays of the sun. It is a versatile plant and can be grown as a topiary or as a bonsai. It is its hardy nature and the closely held bunches and leaves that promoted it into a garden plant. 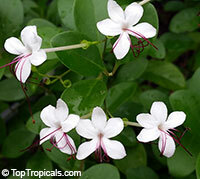 The plants is salt-, heat- and wind-tolerant.